I made this Bakugan cake for my friend’s son’s 6th birthday. 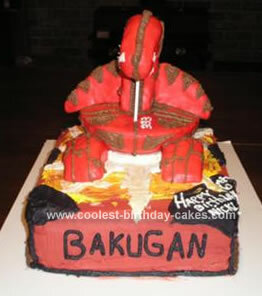 When she asked me to make this cake, I had no idea what a Bakugan was! She gave me a Bakugan toy (which is the size of a large bouncing ball) and a Bakugan card as a models to make the cake. I first made a homemade white cake and homemade buttercream frosting. I baked the cake in a 9×13 cake pan with about 12 cups of batter. I colored some of the buttercream red and frosted the entire cake. My goal was to make the base of the cake look like the Bakugan card. I then colored some buttercream yellow, and some black. I used the rest of the white buttercream and started icing the cake with that in the middle. I used the back of a spoon to spread the frosting in swirls mixing in the yellow to get the right effect of the colors on the Bakugan card. I then made a sun effect over the swirled colors with the white buttercream. I piped on the black colored buttercream on the corners of the cake and piped on the Bakugan name. I then made a batch of Rice Krispie treats for the body of the Bakugan. I shaped a small amount of the rice krispie for the head of the Bakugan. I used a small sports ball cake pan as a mold and let the Krispie treat harden before I cut one half of the ball in quarters for the wings and feet of the Bakugan. I covered the pieces with MM fondant I had made earlier in the week that I had colored red. I put the Bakugan together using wooden dowels, then put it in the center of the cake. I then piped on details with buttercream I had colored a brownish gold. To my suprise this cake was not difficult to make, and it was actually a lot of fun! My friend’s son loved it and his friends did too! That is a cool idea to use rice krispies. This is very cool! I’m trying to get ideas and your cake is really awesome. My son saw it he is 9 and love it! I love the cake, I have to make one for my sons 6th birthday party this weekend and I have been trying to get some good ideas on how to make one open. Closed is easy, but having it open has been my challenge. Thanks for the help!!! I am going to attempt this for my son’s birthday. I appreciate that your creativity has gone before me. This cake is almost exactly like the one I am planning on trying to make for my son’s birthday in March. I was planning on using just cake for the bottom of the Bakugan by stacking 3- 9 inch rounds and rounding the bottom, then using dowels and rice krispy treats for the heat and wings. I think your idea may be a bit easier. Thanks for the model. Great job! !